San Francisco offers one of the best food varieties in the world. During our last visit, we were on the search for the best food in San Francisco. While many people said everything in San Francisco is expensive, we were able to find amazing and unique local places with food under $10. 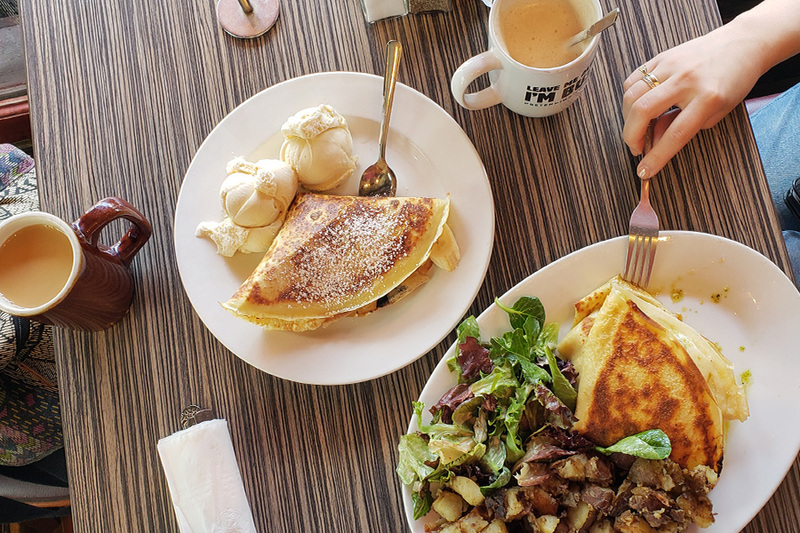 Located just a couple blocks away from Union square is the Honey Honey Café and Crepery. If you are picky eater, you will be pleased with a broad range of foods. Included in the selection is soups, salads, sandwiches, burgers, and pasta. Where they really excel though is their breakfast and brunch food. We enjoyed their Mediterranean style crepes and their dessert crepes, notably their Nutella infused desserts. They also serve delicious fresh orange juice from an automated machine right behind the desk with a glass cover so you can see the process of the oranges getting juiced from start to finish. A trip to San Francisco could never be complete without visiting Fisherman’s Wharf. Here you will find the Boudin Bakery. They were established in 1849 and are particularly famous for their sourdough. Once you enter the shop you will find a café where you can purchase tasty lattes, sandwiches, and unique bread creations. We were especially fond of their coconut coffee and vanilla almond croissants (healthy snack after several hours of walking). Upstairs is a full-service restaurant and bar. When you visit, try our favorite dish, a classic of Fisherman’s Wharf, fresh clam chowder in a Boudin sourdough bread bowl. Smitten Ice Cream offers a uniquely sweet and cool experience. They pour, stir, and freeze your ice cream on the spot! This is done with a mixing machine that uses liquid nitrogen to give you the freshest scoop around. We tried Strawberries and Cream and it was the creamiest ice cream I have ever had. They have new flavors all the time so do your taste buds a flavor and check them out. Our favorite place to eat in San Francisco was the Cinderella Café. (I might be partial to finding Russian food, but you really should go there if you are in the area.) This cozy little restaurant is family owned and operated by a Russian family and has been open since 1953. There are a lot of usual visitors and it seemed that the owners knew most visitors by name. The prices in Cinderella were very reasonable and food was authentic. They also have a wide variety of little breads, pastries and desserts! If you would like to experience true Russian hospitality, delicious cuisine and listen to Russian radio while having lunch, you will be very pleased with Cinderella Cafe. I can’t wait to be back in San Francisco and go there again! One of our favorite locations in San Francisco was Chinatown. In fact, we loved it so much we went a total of four times in seven days! The main reason for this is the ramen. We have always loved ramen and Chong Qing Xiao Mian has set the bar. We ordered the “Beef in Pickled Mustard Green Noodle Soup.” And the name is just as much of a mouthful as the bowl of food you are going to be given. The cost was about $9 and one bowl filled up two of us with leftovers. However, make sure you request the level of spiciness that you like because the dish can be pretty hot. Tell me: What are your favorite restaurants in San Francisco? Share your experience in the comments below! San Francisco is definitely on my bucket list of places to travel to! This is an amazing reference. Thanks! Wow. Thats an amazing reference. Would love to visit SF! And especially after this post! Bring on that food!.. Now you made me hungry! I was just in SF, but this makes me want to go back!